A few of my readers mentioned that a planning sheet for low-acid foods to go with last week’s Canning Planning Sheet would be pretty useful. Ask and ye shall receive, Gentle Readers! I like to plan my canning. But no pressure, really. Har har. You’ll find this on the downloadables page paired up as a two-page PDF with the (Water Bath) Canning Planning Sheet, so if you want both you need only download once. 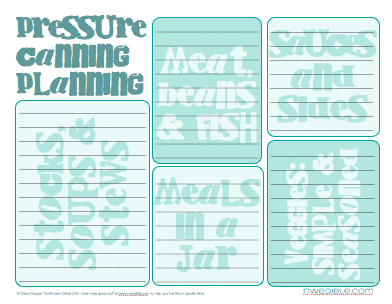 I am a complete pressure canning novice so if you big time pressure canner people think the categories on this are way off, let me know in the comments section. If there is some kind of consensus about a change that needs to be made, I’ll try to get an updated sheet your way soon. blogging site such your own: http://nwedible.com/2012/07/pressure-canning-planning-sheets-low-acid-food. html is challenging to do for inexperienced people? I’ve been hoping to create my own website for a while now but have been turned off mainly because I’ve always assumed it required tons of work.